Essaouira (Berber: Taṣṣurt, Arabic: الصويرة‎, as-Ṣawīra) is a city in the western Moroccan economic region of Marrakech-Tensift-Al Haouz, on the Atlantic coast. Since the 16th century, the city has also been known by its Portuguese name of Mogador or Mogadore. The Berber name means the wall, a reference to the fortress walls that originally enclosed the city. 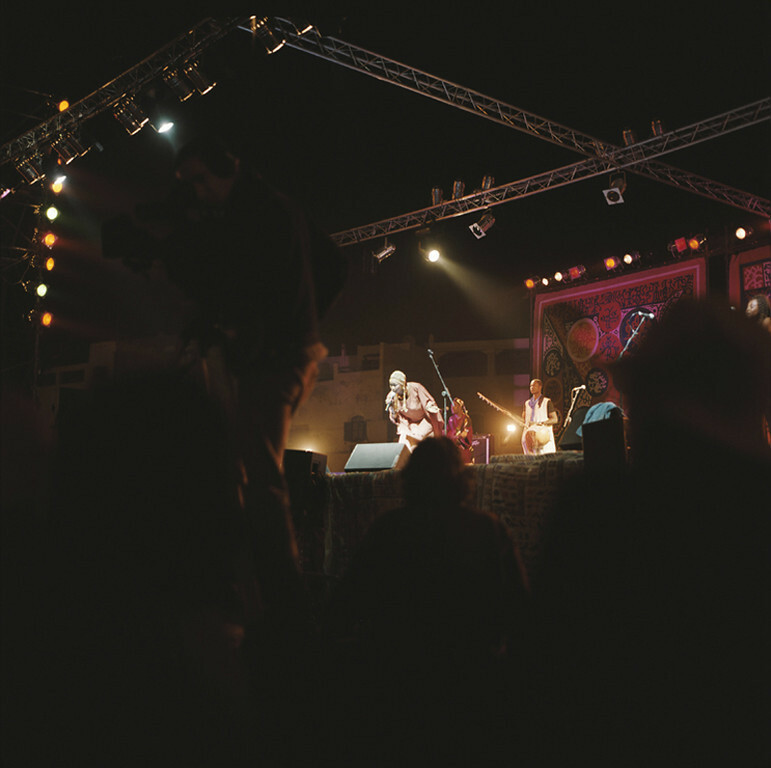 Archaeological research shows that Essaouira has been occupied since prehistoric times. The bay at Essaouira is partially sheltered by the island of Mogador, making it a peaceful harbor protected against strong marine winds. 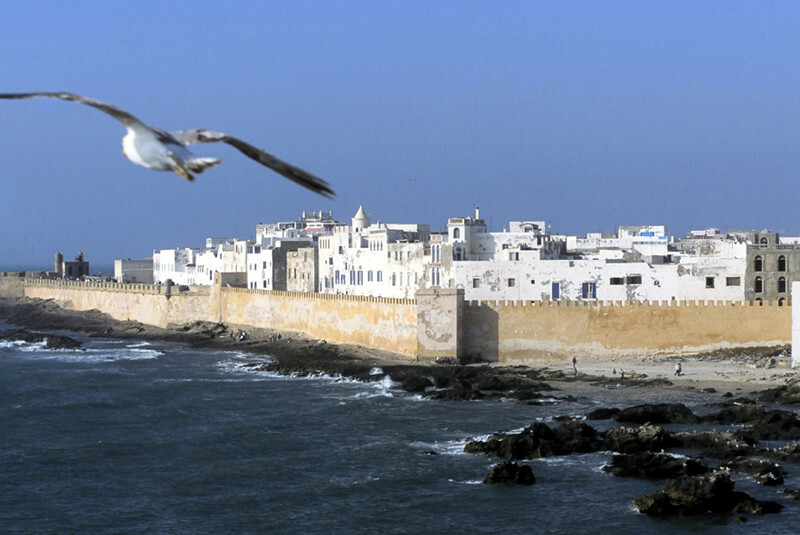 Essaouira has long been considered as one of the best anchorages of the Moroccan coast. The Carthaginian navigator Hanno visited in the 5th century BC and established the trading post of Arambys. Around the end of the 1st century BCE or early 1st century CE, the Berber king Juba II established a Tyrian purple factory, processing the murex and purpura shells found in the intertidal rocks at Essaouira and the Iles Purpuraires. This dye colored the purple stripe in Imperial Roman Senatorial togas. A Roman villa was excavated on Mogador island. A Roman vase was found as well as coinage from the 3rd century CE. Most of the artifacts are now visible in the Sidi Mohammed ben Abdallah Museum and the Rabat Archaeological Museum. During the Middle Ages, a Muslim saint named Sidi Mogdoul was buried in Essaouira, probably giving its origin to the name "Mogador". In 1506, the king of Portugal, D. Manuel I, ordered a fortress to be built there, named Castelo Real de Mogador. Altogether, the Portuguese are documented to have seized six Moroccan towns and built six stand-alone fortresses on the Moroccan Atlantic coast, between the river Loukos in the north and the river of Sous in the south. Four of them only had a short duration: Graciosa (1489), São João da Mamora (1515), Castelo Real of Mogador (1506–10) and Aguz (1520–25). Two became permanent urban settlements: Santa Cruz do Cabo de Gué (modern Agadir, founded in 1505-06), and Mazagan, founded in 1514-17. Following the 1541 Fall of Agadir, the Portuguese had to abandon most of their settlements between 1541 and 1550, although they were able to keep Ceuta, Tangier and Mazagan. The fortress of Castelo Real of Mogador fell to the local resistance of the Regraga fraternity four years after its establishment, in 1510. During the 16th century, powers including Spain, England, the Netherlands and France tried in vain to conquer the locality. 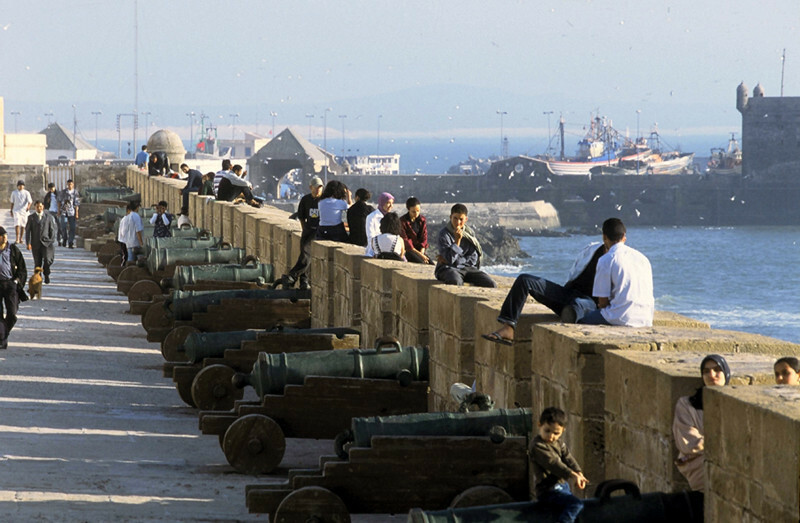 Essaouira remained a haven for the export of sugar, molasses and the anchoring of pirates. France was involved in an early attempt to colonize Mogador in 1629. As Richelieu and Père Joseph were attempting to establish a colonial policy, Admiral Isaac de Razilly suggested they occupy Mogador in 1626, which he had reconnoitered in 1619. The objective was to create a base against the Sultan of Marrakesh and asphyxiate the harbour of Safi. He departed for Salé on 20 July 1629 with a fleet composed of the ships Licorne, Saint-Louis, Griffon, Catherine, Hambourg, Sainte-Anne, Saint-Jean. He bombarded the city the Salé, destroyed three corsair ships, and then sent the Griffon under Captain Treillebois to Mogador. The men of Razilly saw the fortress of Castelo Real in Mogador and landed 100 men with wood and supplies on Mogador island, with the agreement of Richelieu. After a few days, however, the Griffon reimbarked the colonists and departed to rejoin the fleet in Salé. After these expeditions, France signed a treaty with Abd el-Malek II in 1631, giving France preferential treatment, known as "capitulations": preferential tariffs, the establishment of a Consulate, and freedom of religion for French subjects. The present city of Essaouira was built during the 18th century. Mohammed III, wishing to reorient his kingdom toward the Atlantic for increased exchanges with European powers, chose Mogador as his key location. One of his objectives was to establish a harbour at the closest possible point from Marrakesh. The other was to cut off trade from Agadir in the south, which had been favouring political rival of Mohammed III, and the inhabitants of Agadir were forced to relocate to Essaouira. For 12 years, Mohammed III directed a French engineer, Théodore Cornut, and several other European architects and technicians to build the fortress and city along modern lines. 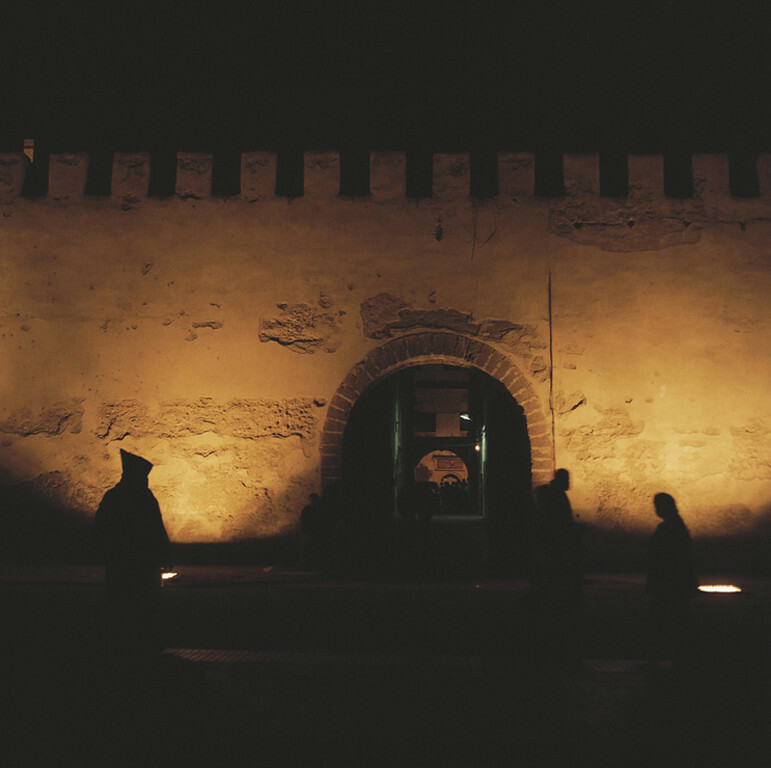 Originally called "Souira" ("the small fortress"), the name became "Es-Saouira" ("the beautifully designed"). Thédore Cornut designed and built the city itself, particularly the Kasbah area, corresponding to the royal quarters and the buildings for Christian merchants and diplomats. Other parts were built by other foreigners. The harbour entrance, with the "Porte de la Marine", was built by an English renegade by the names of Ahmed el Inglizi ("Ahmed the English") or Ahmed El Alj ("Ahmed the Renegade"). The two "scalas" with their fortifications (the Harbour scala and the Northern scala) were built by Genoese engineers. Mohammed III took numerous steps to encourage the development of Essaouira: the harbour of Agadir to the south was closed off in 1767, so that southern trade should be redirected through Essaouira. European communities in the northern harbour of Rabat-Salé were ordered to move to Essaouira through an ordonance of January 21, 1765. From the time of its rebuilding by Muhammad III until the end of the nineteenth century, Essaouira served as Morocco's principal port, offering the goods of the caravan trade to the world. The route brought goods from sub-Saharan Africa to Timbuktu, then through the desert and over the Atlas mountains to Marrakech. The road from Marrakech to Essaouira is a straight line, explaining the king's choice of this port among the many that the Moroccan coast offers. 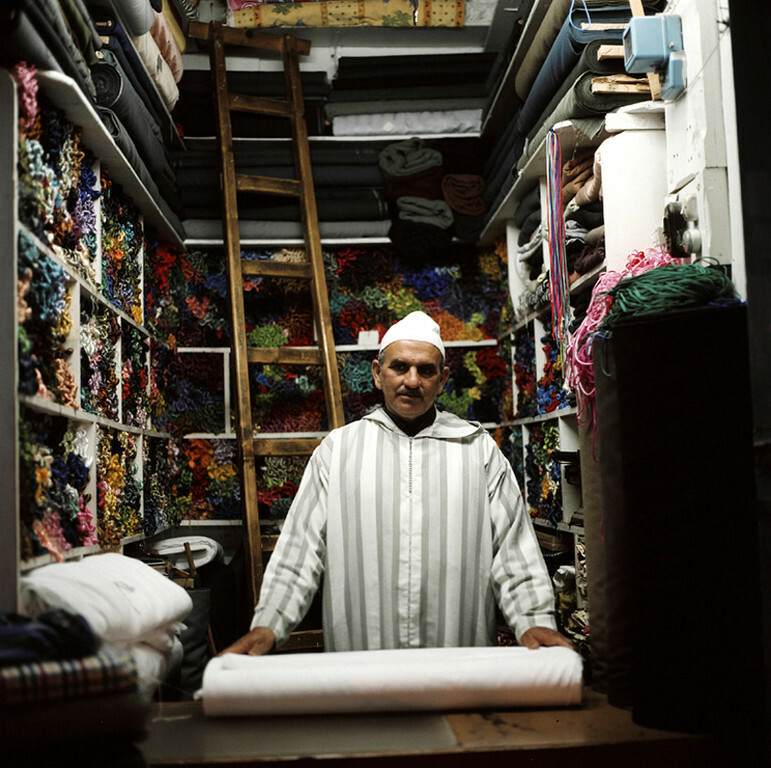 Mohammed ben Abdallah encouraged Moroccan Jews to settle in the town and handle the trade with Europe. Jews once comprised 40% of the population, and the Jewish quarter (or mellah) contains many old synagogues. The town also has a large Jewish cemetery. The city flourished until the caravan trade died, outmoded by direct European trade with sub-Saharan Africa. In the 19th century, Essaouira became the first seaport of Morocco, with trade volumes about double those of Rabat. The city functioned as the harbour for Marrakesh, as it was only a few days from the inland city. Diplomatic and trade representations were established by European powers in Essouira. In the 1820, European diplomats were concentrated in either Tangiers or Essaouira. Following Morocco's alliance with Algeria's Abd-El-Kader against France, Essaouira was bombarded and briefly occupied by the French Navy under the Prince de Joinville on August 16, 1844, in the Bombardment of Mogador, an important battle of the First Franco-Moroccan War. 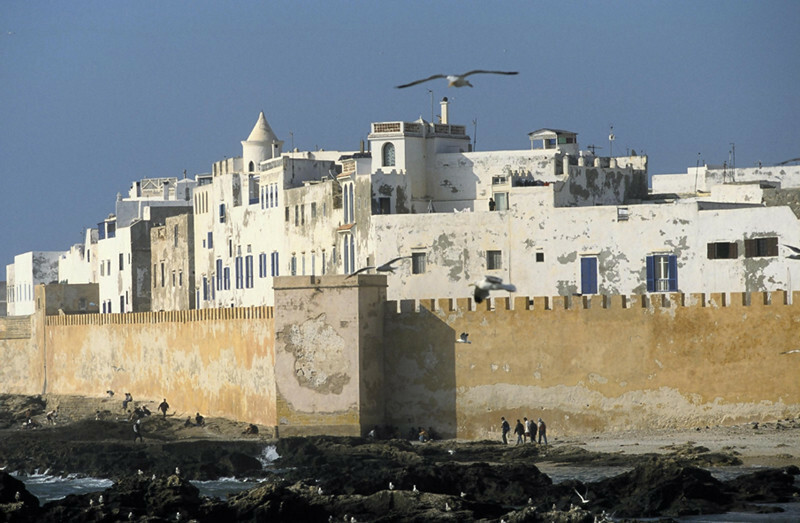 From 1912 to 1956, Essaouira was part of the French protectorate of Morocco. Mogador was used as a base for a military expedition against Dar Anflous, when 8,000 French troops were located outside of the city under the orders of Generals Franchet d'Esperey and Brulard. The Kasbah of Dar Anflous was taken on 25 January 1913. In 1930, brothers, Michel and Jean Vieuchange used Essaouira as a base before Michel set off into the Western Sahara to try to find Smara. France had an important administrative, military and economic presence. Essaouira had a Franco-Moroccan school, still visible in Derb Dharb street. 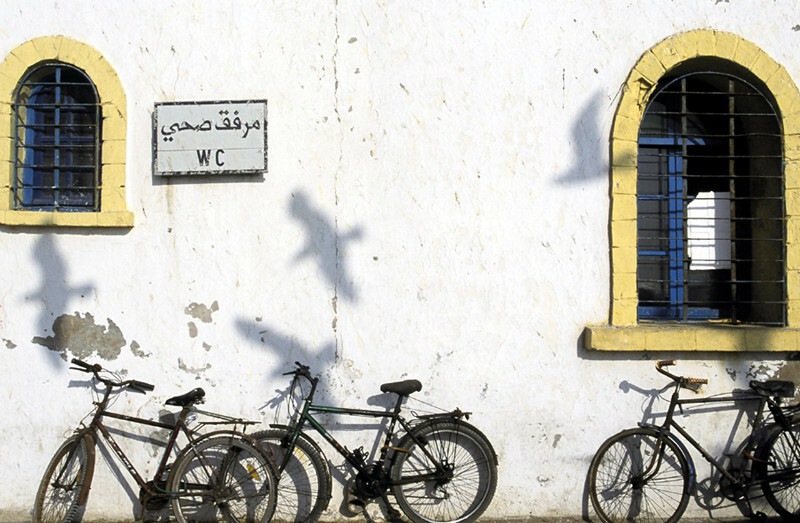 Linguistically, many Moroccans of Essaouira speak French fluently today. 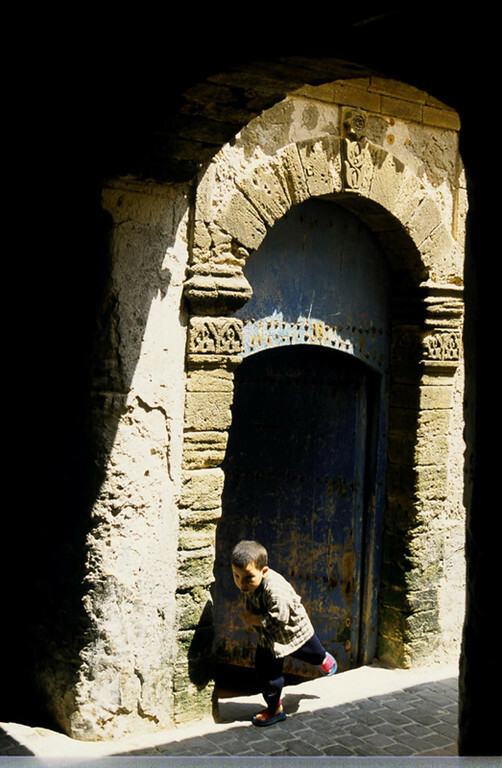 The medina is home to many small arts and crafts businesses, notably cabinet making and 'thuya' wood-carving (using roots of the Tetraclinis tree), both of which have been practised in Essaouira for centuries. The fishing harbour, suffering from the competition of Agadir and Safi remains rather small, although the catches (sardines, conger eels) are surprisingly abundant due to the coastal upwelling generated by the powerful trade winds and the Canaries Current. 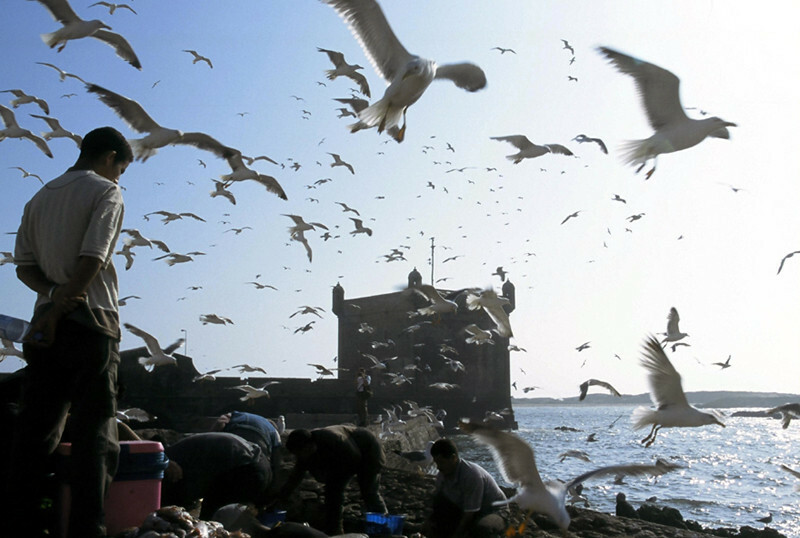 Essaouira remains one of the major fishing harbours of Morocco. Argan oil is a plant oil produced from the kernels of the argan tree (Argania spinosa L.) that is endemic to Morocco. It is used for nutritive and cosmetic properties. The tree is extremely well adapted to drought and other environmentally harsh conditions of southwestern Morocco. The genus Argania once covered North Africa and is now endangered and under protection of UNESCO. The argan tree grows wild in semi-arid soil, its deep root system helping to protect against soil erosion and the northern advance of the Sahara. This biosphere reserve, the Arganeraie Biosphere Reserve, covers a vast intramontane plain of more than 2,560,000 hectares, bordered by the High Atlas and Little Atlas Mountains and the Atlantic in the west. Argan oil remains one of the rarest oils in the world due to the small and very specific growing areas. The earliest known European account of argan trees was by Leo Africanus, in 1510. An early specimen was taken to Amsterdam where it was cultivated by Lady Beaufort at Badminton House in 1711. 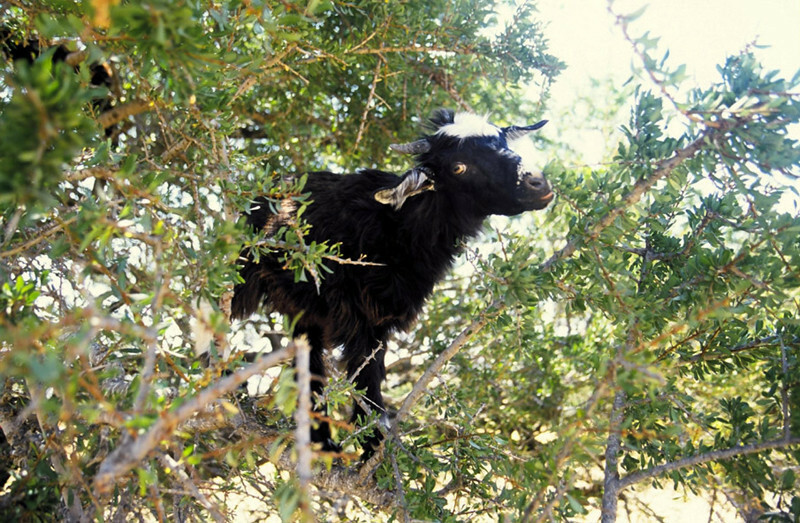 Before modern times, the Berbers of ancient Morocco would collect undigested argan pits from the waste of goats which climb the trees to eat their fruit. The pits were then ground and pressed to make the nutty oil used in cooking and cosmetics. However, the oil used in cosmetic and culinary products available for sale today has most likely been harvested directly from the tree and processed with machines. Now increasingly important for oil produced for sale, as the oil will keep 12–18 months and extraction is much faster. Using mechanical presses, mixing of the dough and water is unnecessary and the dough can be directly pressed. The fruits of the argan tree are nut-sizes and may be round, oval or conical in shape. The fruits are covered by a thick peel which covers the fleshy pulp. The pulp surrounds a hard-shelled nut which represents approximately 25% of the weight of the fresh fruit. Contained within the nut are one to three argan oil–rich kernels. 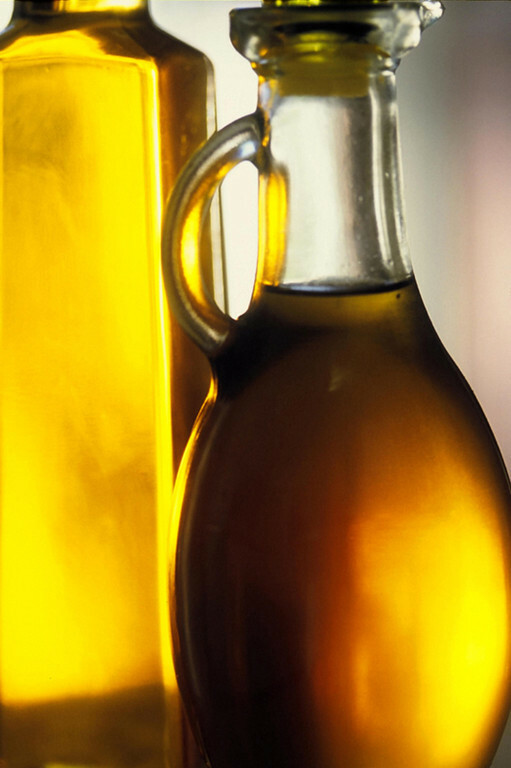 Argan oil is extracted from the kernels, with yields varying from 30% to 55% depending on the extraction method used. 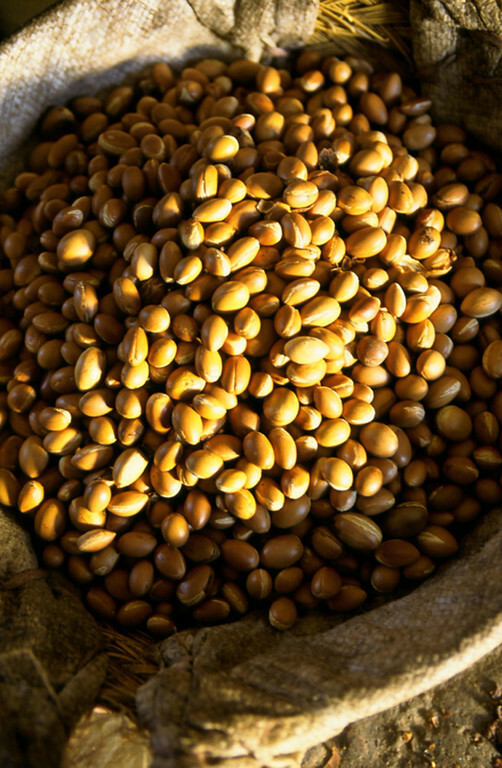 Extraction of the kernels is key to the argan oil production process. In order to extract the kernels, the argan fruits are first dried in the open air and then the fleshy pulp of the fruit is removed. Sometimes the flesh is removed mechanically without the need to dry the fruits. The flesh is usually used as feed for animals. The next stage involves cracking the argan nut to obtain the argan kernels. Attempts to mechanize this process have been unsuccessful and therefore it is still carried out by hand, making it a time-consuming and labour-intensive process. Kernels used to make argan oil for food use, culinary argan oil, are then gently roasted. 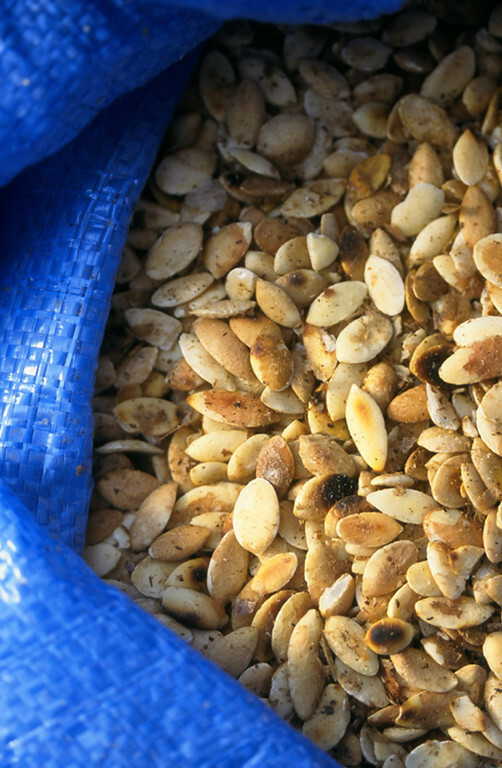 After the argan kernels have cooled down, they are ground and pressed. The brown-colored mash expels pure, unfiltered argan oil. After this, unfiltered argan oil is decanted into vessels. The press cake remaining after the argan oil has been expelled is protein-rich and is frequently used as feed for cattle. Cosmetic argan oil is produced almost identically, although the argan kernels are not roasted to avoid an excessively nutty scent. After pressing, the argan oil is decanted and left to rest for approximately two weeks. This allows solids suspended in the argan oil to settle to the bottom, creating a natural sediment. The clearer argan oil may then be further filtered depending on the clarity and degree of purity required. Pure argan oil may contain some sediment. This is a natural part of the production process and does not affect the quality of the argan oil. The production of argan oil is beginning to have noticeable environmental and social impacts. Argan oil production means that argan trees are now seen as a valuable resource. This has led to their preservation with a secondary impact on the environment. 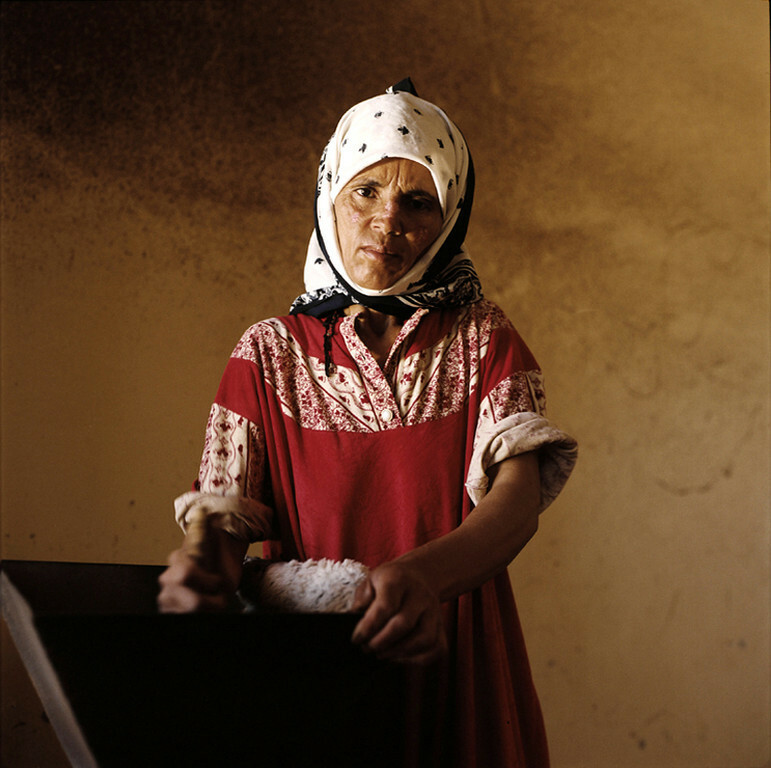 The labour-intensive nature of argan oil production, now frequently carried out by women’s co-operatives, has provided a steady income for many women and their families, improved the social status of some women and has encouraged producers of other agricultural products to examine the co-operative model. The Argan tree provides food, shelter and protection from desertification. The tree has deep roots which help prevent desert encroachment. The canopy of the argan tree also provides shade for other agricultural products and its leaves and fruit provide food for animals. The argan tree also helps landscape stability, helping to prevent soil erosion, providing shade for pasture grasses and helping to replenish aquifers. Producing argan oil has helped to protect argan trees from being cut down. In addition, regeneration of the Arganeraie has also been carried out: in 2009 an operation to plant 4,300 argan plants was launched in Meskala in the province of Essaouira. 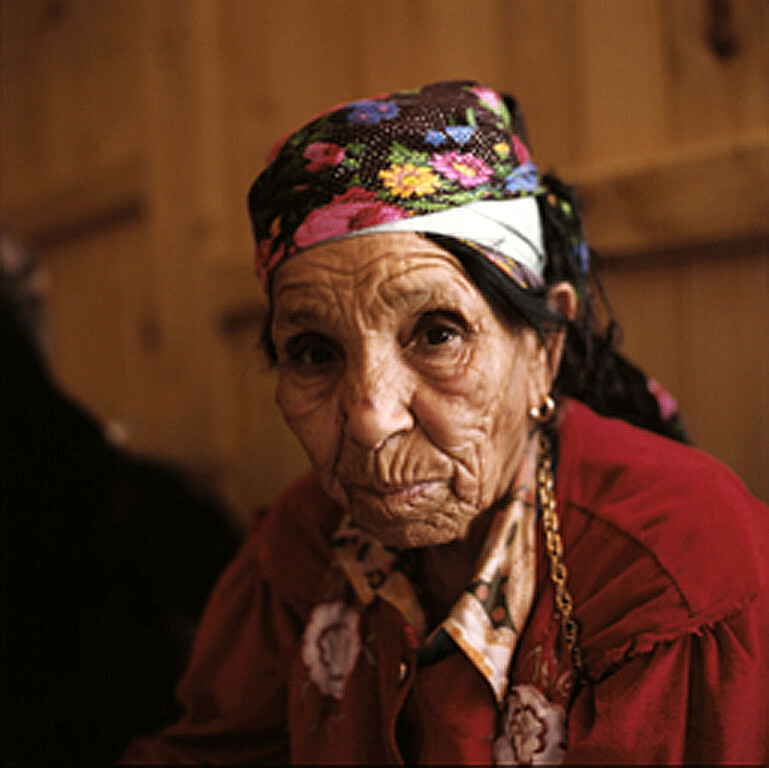 RARBA (Réseau des Associations de la Réserve de Biosphère Arganeraie, Network of Associations of the Argan Biosphere Reserve) was founded in 2002 with the aim of ensuring sustainable development in the Arganeraie. RARBA has been involved with several major projects, including the Moroccan national anti-desertification programme (Programme National de Lutte contre la desertification (PAN/LCD)). The project involved local populations and helped with improvements to basic infrastructure, management of natural resources, revenue generating activities (including argan oil production), capacity reinforcement and others. 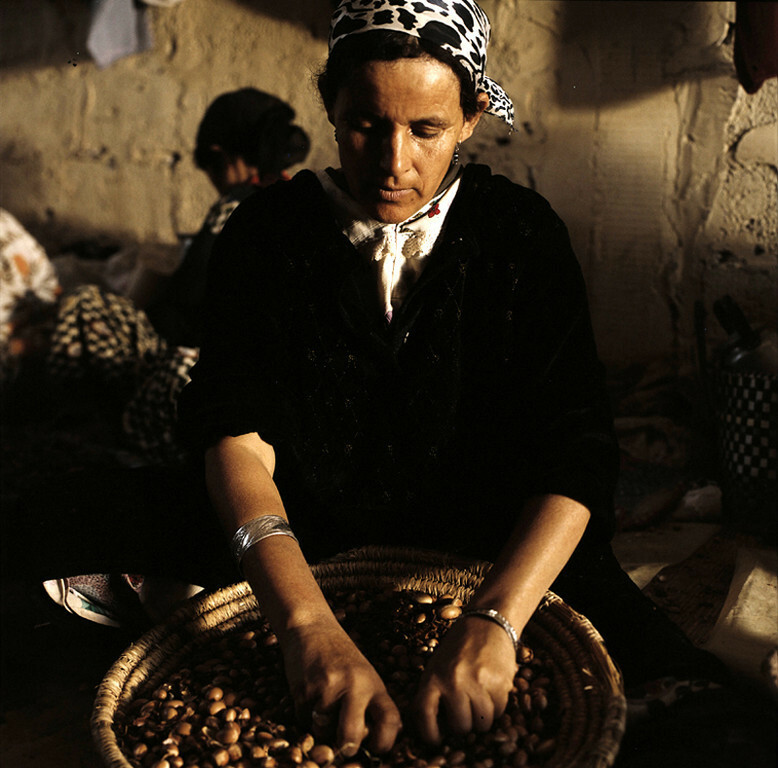 The production of argan oil has always had a socio-economic function. At present, argan oil production supports approximately 2.2 million people in the main argan oil producing region (the Arganeraie). 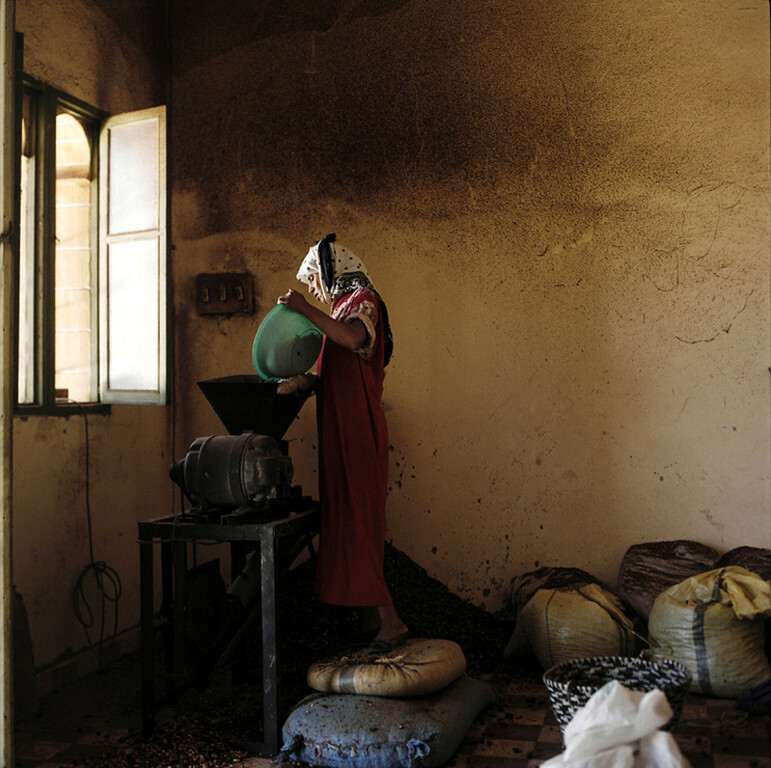 Much of the argan oil produced today is made by a number of women's co-operatives. Co-sponsored by the Social Development Agency (SDA) with the support of the European Union, the UCFA (Union des Cooperatives des Femmes de l’Arganeraie) is the largest union of argan oil co-operatives in Morocco. It comprises twenty-two co-operatives that are found in other parts of the region (e.g., Coopérative Al Amal, Coopérative Amalou N'Touyag, Coopérative Tissaliwine, Coopérative ArganSense, and Coopérative Maouriga). Employment in the co-operatives provides women with an income, which many have used to fund education for themselves or their children. It has also provided them with a degree of autonomy in a traditionally male-dominated society and has helped many become more aware of their rights. The success of the argan co-operatives has also encouraged other producers of agricultural products to adopt the co-operative model. The establishment of the co-operatives has been aided by support from within Morocco, notably the Fondation Mohamed VI pour la Recherche et la Sauvegarde de l’Arganier (Mohammed VI Foundation for Research and Protection of the Argan Tree and from international organisations, including Canada’s International Development Research Centre and the European Commission. Funding has enabled technical support for the production and marketing of argan oil and for technical, professional and personal development of the women involved in the cooperatives.